Dressing for the holidays can be expensive if your event calendar is as jammed as mine. I recently discovered the new re-sale shopping site, Vinted, and have purchased some expensive J.Crew accessories for my holiday ensembles at crazy low prices. You can sell, swap, buy, or give away your pre-loved clothes, shoes, and accessories through the Vinted website and app. I've had so much fun shopping their eclectic selection. Refresh your wardrobe by selling and buying directly from other stylish ladies. 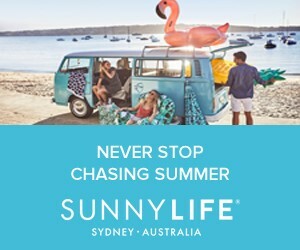 Sign up for the Vinted app with this link and use the code FASHB and you will receive a $10 credit towards your first Vinted purchase! Beautiful outfit, love how you've styled it! Your boots and sweater are just perfect! Pretty outfit! Love the bag! You always look so fabulous, such a great inspiration. Fun look! And thanks for the tip about Vinted. I'll have to check them out! That necklace is so pretty. Such a good find from that site. Ahhh, I love this outfit. You look soooooo cute. That bag is everything! LOVE EVERYTHING. Cutest phone case ever, cutest bag ever, fab jewels, and those boots are to die. You never fail to impress me. Great look, hun. Heading over to check out vented now. Absolutely love this look! That bag is adorable! Beautiful outfit, love the color combination - so pretty! 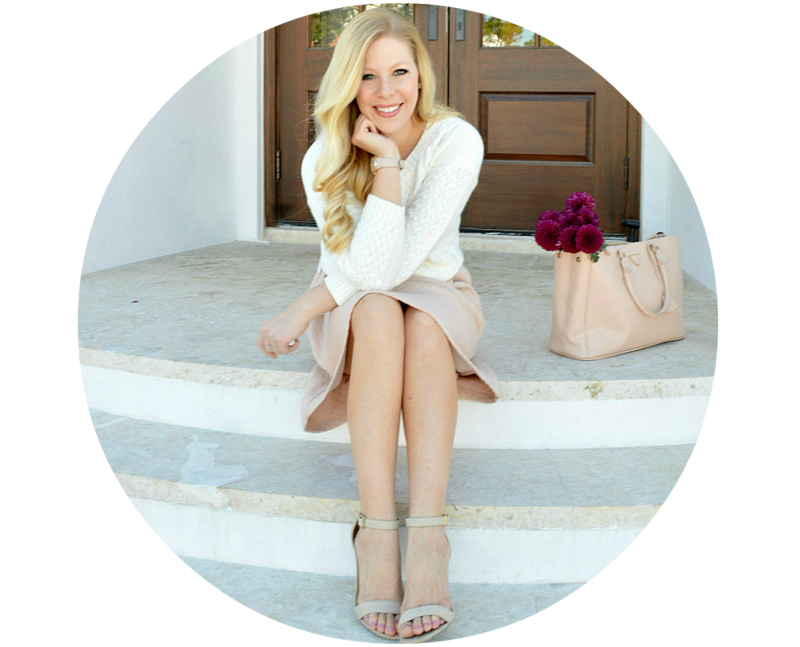 Absolutely love this post and your sweater! What a cool concept! I was just thinking the other day that I have way too many dresses I don't wear too often! Definitely looking into this! 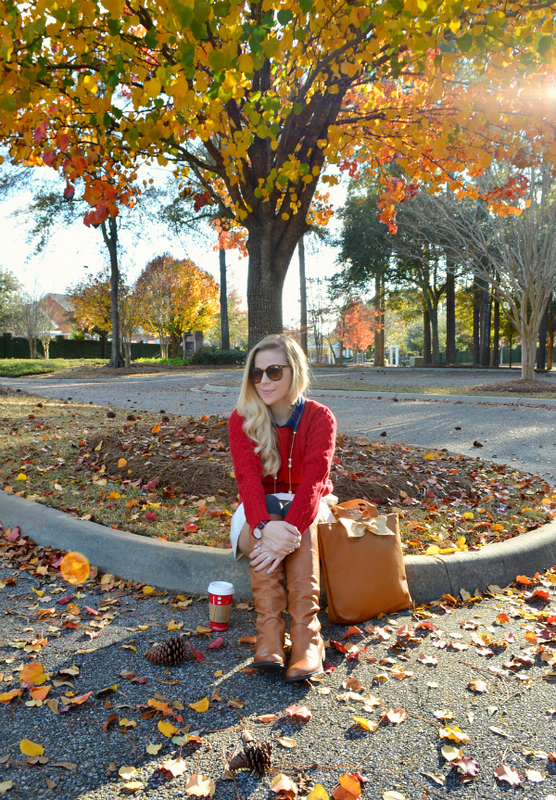 Love your red sweater and how cute is that bag?? So beautiful! I love your bag! Love this holiday look! That bag is adorable!! I love this look from head to toe. What a cute layered look - I love the bow on your bag! This look is so cute. I love all of the elements you're giving. Plaid collar that pops out, a yummy cable knit sweater (front tuck), winter white a-line skirt, peek-a-boo over the knee socks, perfectly neutral boots and a bag that reads, "how cute am I". I'm so jealous, I want this look! 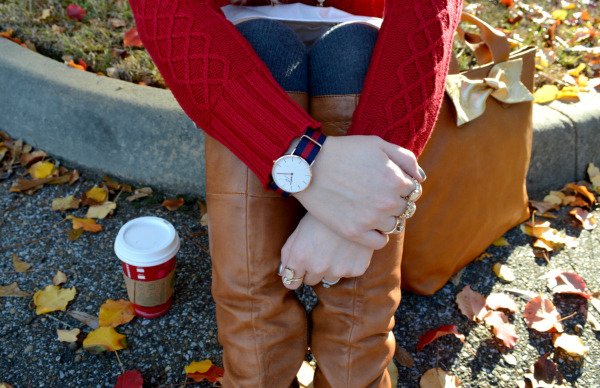 I love the red and camel combo! Great boots! You rock in that outfit! I love this outfit! The boots with the knee high socks peeking out are so cute. And the plaid blouse under that red sweater is great. Lovely watch too! What a cool, schoolgirl reminiscent look. Gorgeous look. Perfect for the holidays! Love it. I'm always a fan of red and white. Love this outfit. You can never go wrong with bows, that purse is darling and your phone case is super cute! Hi Anna! This is a great Fall look that's also great for the holidays. You look gorgeous! Lovely sweater! I have the similar one! Looking superb to see these . Like your all capable photos here .